Will your generator back you up during bad weather? You don’t want to risk finding out the wrong answer during a severe thunderstorm. We recommend that you be proactive and prepare for severe storm season in advance. Our generators perform an automatic weekly self-test that can be described as an idle or unloaded mode. If you already own a Generac generator, we encourage you to manually perform a full system test. Switch off the service disconnect (circuit breaker) supplying the automatic transfer switch (ATS) or transfer switch. The generator will start after a 10 second delay. Once operating, it will connect your home circuits to the generator. Switch the service disconnect to “On” when you wish to end the test. After a 15 second delay, the ATS will switch back to Utility (ComEd) power. The generator will continue to run for 60 seconds to cool-down, and then shut off automatically. Testing your generator on a regular basis is highly recommended. Your family and your home will reap the benefits of having a severe weather preparedness plan in place. And you’ll weather the storm in confidence! 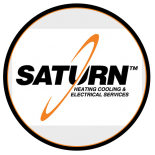 Contact Saturn Heating Cooling & Electrical for assistance with testing your generator. ©2019 Saturn Heating Cooling & Electrical Serivces - Do not copy. All rights reserved.